During the student protests in 2016, the Postgraduate Health Science Students Council (PGHSSC) presented the Deanery with a list of demands affecting postgraduate students. At the request of the PGHSSC and the Deputy Dean of Research, an ad hoc advisory committee was created to assist the postgraduate students in ensuring their issues were addressed. This led to the establishment of the UCT Faculty of Health Science Postgraduate Student Oversight and Advocacy Task Team (FHSPG TT). See full mandate here. The aim of the FHSPG TT, which is comprised of members of UCT staff, postdoctoral fellows, and the PGHSSC, is to provide an oversight and reporting structure to ensure transparency and accountability. Working together with PGHSSC representatives, we aim to understand the problems and improve the working environment facing postgraduate students within the FHS, and to engage the Deanery in ensuring all issues are resolved, primarily through the office of the Deputy Dean: Postgraduate Education, but also through other relevant FHS committees and executive structures. As facilitator between the FHS committee and management structure to suggest solutions or methods of implementation to FHS, and to return feedback on progress or recommendations made by the FHS committees to PGHSSC. In this way, the PGTT will enable frank and transparent communication between the PGHSSC and the FHS while mitigating concerns of student victimisation. Through sub-committees may act as an advocacy group for the postgraduate student body under the directives of the PGHSSC, acting as their advisors in addition to providing a formal means of communication between the student body and FHS structures. Ensure the requests of the PGHSSC are communicated clearly to the FHS structures and to follow up such matters to confirm they are duly executed and, if this is not possible, that the reasoning behind non-execution is given. 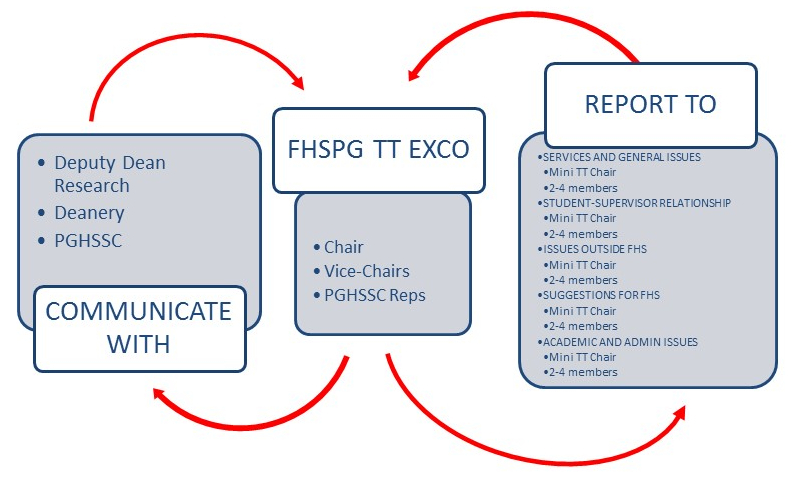 The initial members of the FHSPG TT consist of staff, postdoctoral fellows, and students who have responded voluntarily to the call sent out by the Deanery in 2016. At the directive of the PGHSSC, the FHSPG TT is staff driven; therefore, the team is led by Co-Chairs nominated by the FHSPG TT. These individuals, together with a sub-committee of members from the EXCO, will communicate directly with the Deanery on behalf of the task team. The task team is sub-divided into several working groups (mini-Task Teams) arranged by the PGHSSC to tackle specific concerns; these include: Services and General issues; Student Supervisor relationships; Academic and Administrative issues; Issues transcending FHS; and Suggestions for FHS. 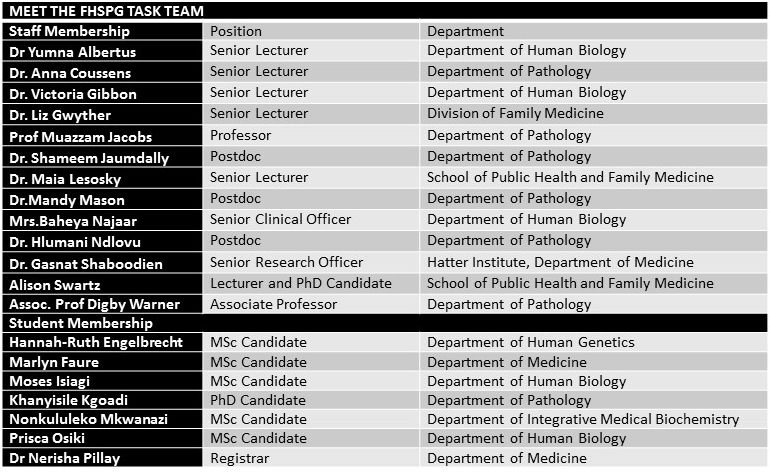 These mini-Task Teams – each of which is led by an appointed mini-Task Team Chair – will facilitate the engagement between PGHSSC and the FHS committees and management, and will act as individual advocacy groups for the postgraduate student body. All members have made the commitment to address and solve the demands raised by the PGHSSC.